Original decoration for girls. You can embroider on a school or sports bag. If you are planning to decorate a nursery you can sew a pillow. If you are looking for a birthday present. You can steal a bath or beach towel, add the name of the child. The project is not complicated. You can easily change colors. Size: 5.45 x 7.6' We would like to thank you for choosing OUR embroidery designs for your next project. When you are using our designs in your embroidery or garment embellishment please share your ideas, techniques, projects and photos of your final product with us. You can publish these photos in your personal album on our page here (insert a link on how to set up a personal album) or in the Support page here (insert a link to where they can publish the photos) if you don’t have one as yet. It is fascinating for other novice users of embroidery to see what is possible to achieve with different embroidery designs and most importantly publishing photos and projects will earn YOU one free bonus design for EACH successfully published photo! This is in front view on nice spacious bag which can be used as school bag or storage for books and tablet PC for student. 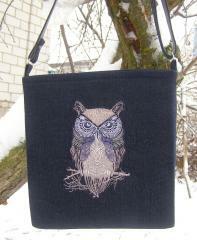 Its front side is embellished by Tribal owl machine embroidery design. It is well known that owl is very wise bird. That’s why it is symbol of knowledge and education. It is difficult to imagine more suitable sample for this work piece!